Yesterday I managed to make decent 16mm H7 holes, but it breaks always a cold sweat. Odd barrel hole and oversized holes are fact if you chuck the reamer or hold it in a tap wrench. Looking for a practical design to make one. I have found Hemingways design that used Odlhamn coupling principle. 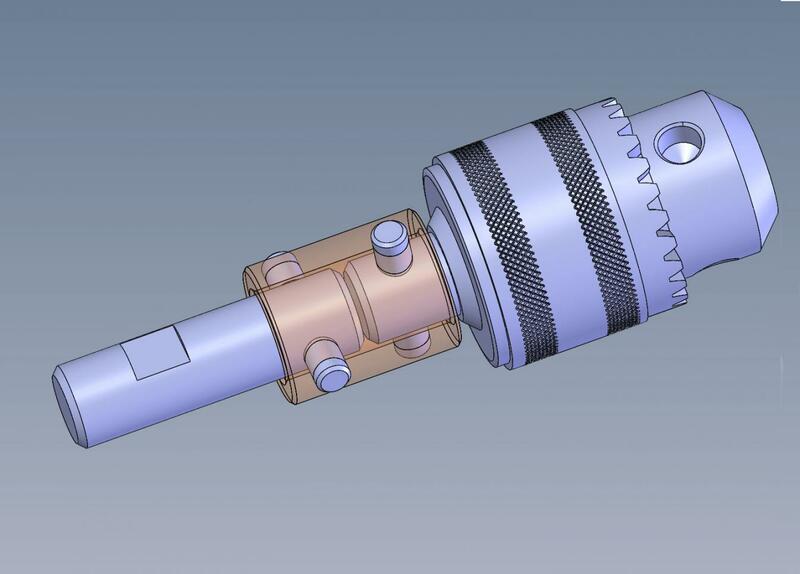 2: Looks clearance holes on the shell perimeter will cause pins to center the reamer holder, probably not ideal. Holes could be slots to counteract on this tendency, needs keepers though to prevent it falling apart. Am I wrong or (least partially) right? Have to read it again, you use external linkage? Given that the pictures referred to in "reply #12" are mine, I'll try to example how it works ... first off my holder is an adaptation of a design shown in Model Engineers Workshop magazine some years back (can't remember the issue number). The tool in the photos consists of a changeable tool holder so that small dies or an ER16 collet can be used. 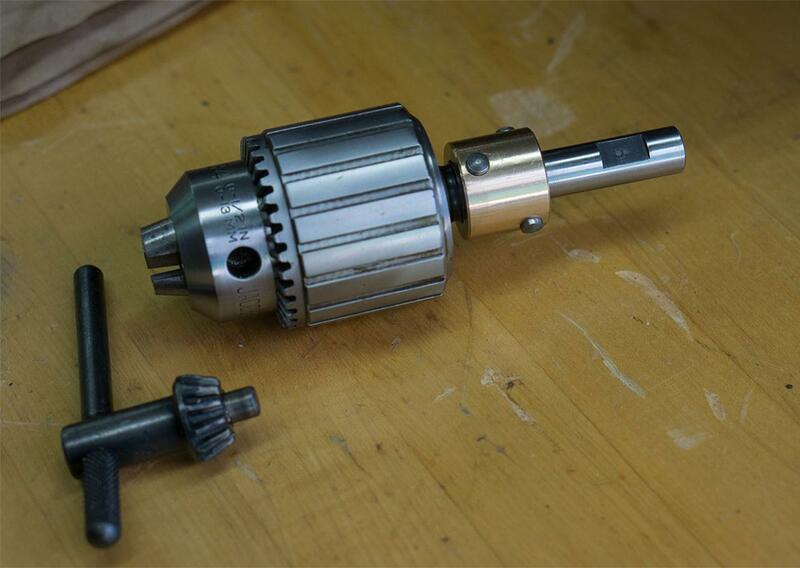 The collet can be used to hold small taps or reamers. The tool holder has three spring loaded "pins" that maintain some tension between the back face of the tool holder and a flat flange on the end of the arbour that is inserted in the tailstock. A threaded collar allows the head to be removed. In use the holder is intended to keep the tool (e.g., tap or reamer) parallel to the lathe centre line while allowing a small amount of shift side-to-side. The holder also slides towards the work as the cut or threads are being applied. Is it perfect - probably not. It was a interesting tool to make though and surely more accurate than some of the other ways (I've) used. I like many features of your design. I like that it can be used for threading, both taps and dies. I considered this feature as a separate device. This is a novel idea. I was wondering that three spring arrangement. Now your explanation makes it pretty clear, it's just some spring function and no tilt&balance stuff there - the holes on carrier perimeter are for tommy-bar! Doh! But why is the spring force acting that way? Separating the pieces and creating a little lost movement that way on forward motion? Are there some other attachment or features? i see that there is groove on that extension part (tubular part with a flange). Typically it would keep the part from rotating. But you use tommy-bar to prevent rotation. So my guess is that the groove could have a stop and simply prevent head from accidental dropping? I enjoy a lot when I can follow the rationale of the design. Yes the holes on the carrier perimeter are for a Tommy Bar. The springs and brass "tension pads" and the depth of the holes they fit into are sized so there is tension on the flange and very little play forward and back. Something around 10 thou. The groove on the tubular part with the flange works with a key to keep the flange piece from rotating in the MT3 arbour. I'm sure it would all work without it but felt it was a good idea to include. There is no stop but that would be a good addition ... I need to be mindful when handling it off the lathe. At this point there aren't any other attachments but left room in the storage container for another head. Perhaps an ER32 version or a small die holder. My pictures are embedded, but you apparently have to be a member of MEM to see then. I started off looking at floating reamer holders for smaller holes, 1.5 - 2 mm. I found the Hemingway version but felt it was too big. I also started on an own design with swinging links (attached) but I think it would have required some centering springs. Charlie has explained his version and I have attached the picture that go with reply #3 the Clarkson version. I also found details of a Swiss version (attached) which in the end I purchased. I carried out a series of experiments with different initial drill sizes and different reamer feed rates which are documented in the MEM thread. I obtained the manufacturers data for the reamers I was using which resulted in much higher speeds and lower feed rates than I started with. I hadn't washed the dirt off my fingers in those photo's either. Thank you. That is a great help. The testing of small hole reaming was most informative as well. I have done some drawings - doodles and many parts are clear, BUT having a little trouble making my mind over interchangeable adaptor sleeves. Very much considering using parallel MT1 and MT2 adaptor sleeves. Tempted to choose ONE diameter for MT sleeves and ER collets. Only trivial question seems to be choosing one inch diamter or 25 mm diameter, but looks like I have to split order over several shipments (which is no big deal in UK/US, but here if I order something from UK it is 20€ or so). I don't want to use MT2 to ER adapter, because I learned that mass here is not friend with small reamers. 2: Are the adaptor sleeves generally ground outside consentric with MT-cavity and end dimple? My cunning plan is to grind 1" MT adaptor outside straight and to 25 mm diameter between centres if I can't source 1" ER holder. Difficult questions but don't forget that you can clamp the 'working end' of an adaptor onto a mandrel to grind the 'fixing end'. Another thought is that as it is a floating holder the concentricity of the holders is not so important. The picture shows clamping a 4 jaw independent chuck onto the lathe flange backwards so I could bore it out to fit. I was first thinkking that in floating reamer application a little exccenttricity does not matter much. It is a little relative ofcource...the moment that "straghtens" the reamer is pretty damn small, therefore mass of the moving parts and minimum amount of friction is a good thing on this application. Another reason is that I have very few dependable measuremet instruments. I probably would end up using these parallel MT sleeves on measuremet of tools too, there paraellism of MT-cavity and outer shell is a good thing. Plan "A" is to order 1" parts, clock them and if they don't look good enenough I'm going to stick drill shank (that has centering dimple at the end) and use the dimple a the end of the MT parallel adapter to grind OD. Goingin to order some parts this weekend. Most of the parts will come from ARC-eurotrade, my usuall suspect but the postage is killing, therefore I usually wait until I have reasonable amount in order. Page created in 0.021 seconds with 19 queries.